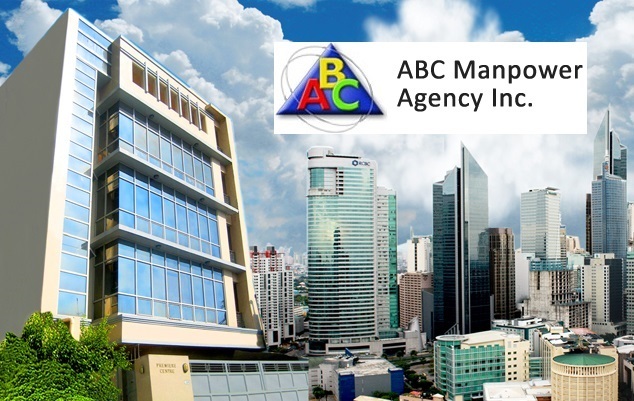 Here is another featured overseas recruitment agency – ABC Manpower Agency Incorporated, one of the leading overseas recruitment agencies in the Philippines. The agency was established way back 1997 backed with international consultants and advisers from Canada, Singapore, and in Hong Kong. They at first started deploying skilled workers in Hong Kong and Singapore. As their name became known to international employers and clients, they were able to expand their services to other countries in Asia, Middle East, Canada, Australia, and United States. From their humble beginnings 18 years ago, ABC Manpower Agency Inc. has already deployed more than 18000 Overseas Filipino Workers (OFW) in 12 countries which includes Bahrain, Brunei Darussalam, China, Oman, Taiwan, Qatar, and United Arab Emirates. These lists are continuously growing as new international clients seeks ABC’s help when comes to their manpower needs. ABC Manpower provides skilled workers and professional staffs to overseas clients under these categories: Administrative, human resource, accounting, and finance; IT, Multimedia Arts and Entertainment staff; Retail Staff; Healthcare and Medical Staff; and also deploys Household Workers. 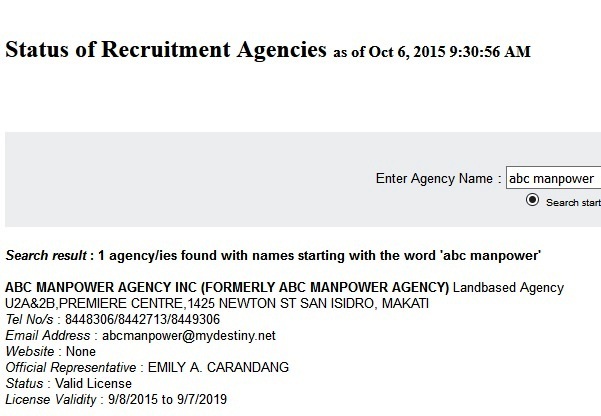 Based on POEA website verification, ABC Manpower Agency Inc. is a landbased manpower agency in the Philippines. 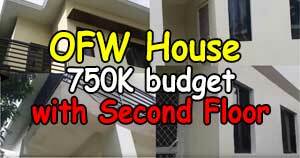 Their main office is located at U2A and 2B, PREMIERE CENTRE, 1425 NEWTON ST SAN ISIDRO, MAKATI. 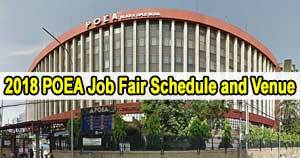 They are a POEA accredited agency with license number POEA-155-LB-081111-R. License validity is from September 8,2015 until September 7,2019. ABC’s official representative is Emily A. Carandang. This featured recruitment agency has 5 branches in the Philippines. 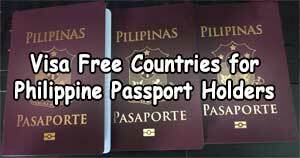 Its main branch is in Makati but they also have satellite offices in Isabela, and other parts in Northern Luzon. Note: This blog is not in any way related to the featured manpower agency. For your own safety do not place on the comments your full name, phone number, and address. Direct your inquiries to the person authorized by the agency by calling their office. Their contact details are included in the post.